Although conflict, violence, and war endure, the methods through which political goals are pursued are always evolving. How this change in the character of conflict will play out and what the Joint Force must do to prepare to meet the demands of tomorrow requires our collective attention. Looking ahead, competitive behavior between the U.S. and potential – and actual – adversaries will be overt and violent. But just as often, our interaction with competitors will include attempts to deter and deny us our strategic objectives or be marked by ambiguous, but still coercive pursuit of political goals backed by the threat or potential of applied military power. Over the next two decades, both overt and ambiguous competitive interactions between dissimilar military forces will be a normal and recurrent condition for the Joint Force. Looking into this future is challenging. However, the difficulty in looking ahead does not excuse the military professional from considering the demands of future war. As the ultimate guarantor of the safety and security of the United States, the Joint Force must simultaneously adapt and evolve while neither discounting nor wishing away the future reality of strife, conflict, and war. To think about the future usefully, we must describe change in a rigorous and credible way. Concurrently, we must creatively account for the unexpected by stepping outside the assumptions and certainties that anchor us to today. The Joint Force will best contribute to a peaceful and stable world by developing capabilities and operational approaches attuned to the evolving character of conflict. Together, we will use this document – Joint Operating Environment 2035 – to support and accelerate our future strategy and force planning activities across the Joint Force. It is a primary source of the problem sets addressed through the forthcoming Capstone Concept for Joint Operations and related force development activities. The ideas here should encourage a dialogue about what the Joint Force should do and be to protect the United States, its allies, its partners, and its interests around the world in 2035. This document describes the future security environment and projects the implications of change for the Joint Force so it can anticipate and prepare for potential conflicts. To do this, Section 1 describes the circumstances that are likely to alter the security environment. Next, Section 2 explores how the intersection and interaction of these changes might impact the character of war in the future. Finally, Section 3 provides a framework to think about the full range of Joint Force missions and how they may evolve over time. The future security environment will be defined by twin overarching challenges. A range of competitors will confront the United States and its global partners and interests. Contested norms will feature adversaries that credibly challenge the rules and agreements that define the international order. Persistent disorder will involve certain adversaries exploiting the inability of societies to provide functioning, stable, and legitimate governance. Confrontations involving contested norms and persistent disorder are likely to be violent, but also include a degree of competition with a military dimension short of traditional armed conflict. These connected challenges are shaped by a wide range of trends and conditions. The future World Order will see a number of states with the political will, economic capacity, and military capabilities to compel change at the expense of others. In Human Geography, a range of social, economic, environmental, and political pressures will push states past the breaking point, spilling over borders, and creating wide-ranging international problems. The future of Science, Technology, and Engineering will see others reaching for technological parity as well as designing innovative mixes of high and low technology that may allow adversaries to more effectively challenge U.S. interests. The intersection of trends and conditions reveals the changing character of war. The future of conflict cannot be understood in terms of individual trends. Issues and problems intersect, reinforce, and compound across many diverse areas. Sometimes relationships are clear, but more often they interact in unanticipated and surprising ways. Thinking through combinations of trends and conditions over many disciplines allows us to better anticipate changes in the character of conflict and illuminate why the Joint Force may be called upon to address threats to U.S. national interests. 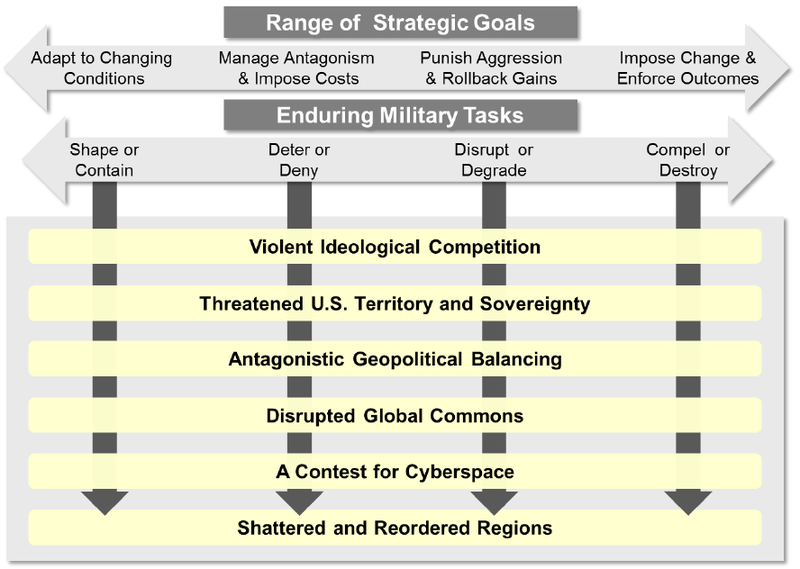 Warfare in 2035 will be defined by six contexts of future conflict. In 2035, the Joint Force will confront Violent Ideological Competition focused on the subversion or overthrow of established governments. Threatened U.S. Territory and Sovereignty will become increasingly prevalent as enemies attempt to coerce the United States and its citizens. Antagonistic Geopolitical Balancing by capable adversaries will challenge the United States over the long term and place difficult demands on the Joint Force over wide areas of the globe. Intimidation, destabilization, and the use of force by state and non-state actors alike will result in Disrupted Global Commons and A Contest for Cyberspace. Internal political fractures, environmental stressors, or deliberate external interference will lead to Shattered and Reordered Regions. Each Context of Future Conflict poses a troubling problem space for the Joint Force. The contexts, when matched with a range of strategic goals, drive an evolving set of missions. The Joint Force must prepare for a wide range of missions designed to address these contexts. This set of Evolving Joint Force Missions must at once protect our national interests, deter conflict, punish aggression, or defeat adversaries who act across regions, domains, and functions. These evolving missions will be shaped by a continuum of strategic goals that range from reactively managing security challenges to proactively solving security threats and imposing U.S. preferred solutions. This span of missions will require a diverse set of capabilities and operational approaches – some of which are not available to the Joint Force today. The evolving mission set demands new operational approaches and capabilities. Placing too much emphasis on contested norms – particularly those high-tech and expensive capabilities to contain or disrupt an expansionist state power – may discount potentially disruptive low-end threats, which have demonstrated a troubling tendency to fester and emerge as surprise or strategic shock for the United States. Conversely, tilting the balance of force development activities towards capabilities designed to counter persistent disorder may risk a world in which other great powers or alliances of great powers decisively shift the international order in highly unfavorable ways. Ultimately, the future Joint Force will best contribute to a peaceful and stable world through well-crafted operational approaches attuned to the evolving character of conflict. JOE 2035 sets the foundation for the future Joint Force. The ideas found within JOE 2035 set the stage for a more detailed conversation about how the Joint Force can achieve success in the future security environment. JOE 2035 was written to accelerate new ways – or concepts – for the Joint Force to address the likely needs of future strategy and thus, identify a foundation upon which enduring U.S. military advantages can be built. 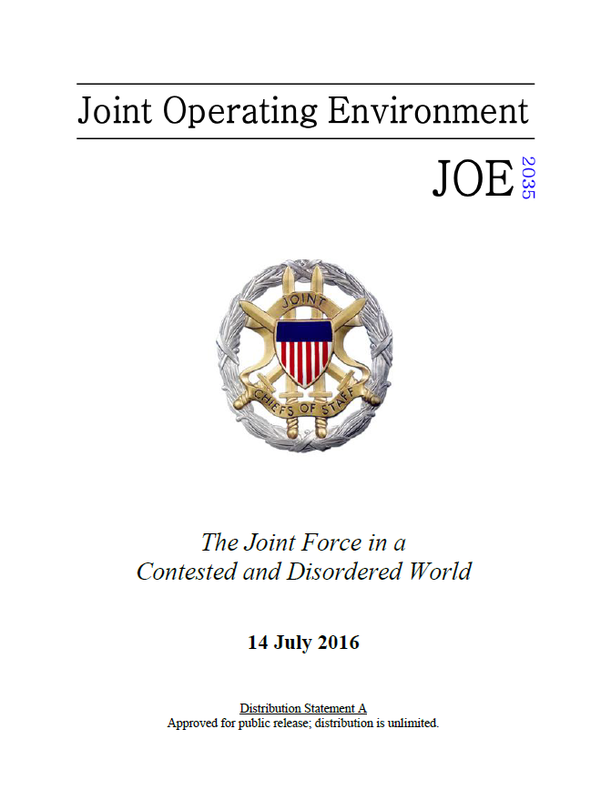 Going forward, JOE 2035 will orient a wide range of future force development activities and provide an analytic basis for ongoing Joint Concept development efforts, particularly a revision of the Capstone Concept for Joint Operations (CCJO).